The program, modeled after the prestigious Malcolm Baldrige National Quality Award is recognized as one of the strongest state-level quality award programs in the country. It offers a thorough and objective educational process through which an organization can learn and apply quality implementation techniques and assessment methods. 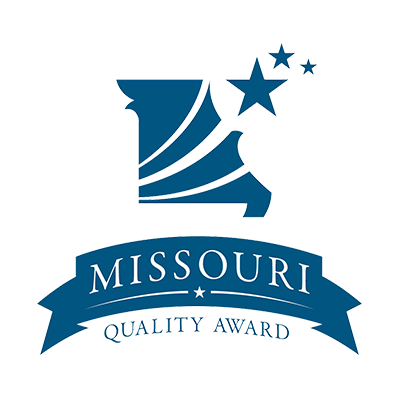 Organizations participating in the Missouri Quality Award process join a growing number of Missouri organizations that are dedicated to promoting quality as a vital element to enhancing customer satisfaction and operational performance. Through their willingness to help others, the Missouri Quality Award Recipients have encouraged other organizations to undertake their own quality improvement efforts. In January of 2009, Research Psychiatric Center implemented the Baldrige Framework for Performance Excellence, including a five-year plan for overall hospital improvement. The goal is this: demonstrate measurable improvement across all metrics through the Baldrige program. Best Practice results recognition throughout the Kansas City market. The Gero-Psych unit at Research Psychiatric Center was selected for the “Team Steps” fall (slips, trips) reduction program and has achieved a more than 50% reduction in patient falls. The Baldrige Performance Excellence Program has made a significant difference in Research Psychiatric Center’s success and sustainability. Our goal is to continue to improve our performance to world-class level, and ultimately, recognition as a Malcolm Baldrige Award winner. Our journey is one that will take us from good to great. For more information concerning Research Psychiatric Center’s journey through the Baldrige Performance Excellence Program, call us at 816-444-8161 or use the Contact Us form on our home page, select “General Questions/Comments” and put “Baldrige” as the first line.